I’m so excited about this guest post by Densie Webb today because I’m totally on-board. In my upcoming novel, The Good Neighbor, there’s definitely a “stealing” story which I’ll share! So it’s good to know I’m in amazing company — Densie included! Share in the comments where your ideas come from! And please welcome Densie Webb back to WFW! I Steal Like An Artist, Don’t You? As writers, nothing we create is original. There, I said it. But, even that is not an original thought. The greats, like Picasso and Eliot, even the Bible, it seems, were bold enough to admit it long before I typed those words. As writers, creators, dreamers, we all like to think that our ideas, our words, our stories are unique. But we’re all hoarders. We watch, we listen, we read, we observe. We collect. And when we’re good and ready, we raid our collection for the perfect thing to slip into our stories. Family and friends—Listen to them. No, really listen. There are pearls in there that you may never have manufactured on your own. And they’ll slip by in conversation unless you’re constantly in scan mode. My 24-year old son, in talking about his 20-year old sister hanging with her gaggle of girlfriends, said, “Did she go into a gossip coma?” I felt all the neurons in my brain light up. A “gossip coma”? Yes! And it made its way into my book. A good friend of mine always sticks her cell phone in her bra. That way, she always knows where it is. And yes, one of my characters pulls her cell phone out of her bra, making for an interesting scene with the male protagonist as she retrieves it and hands it to him. A friend and colleague, whom I’ve known for over twenty years in my day job, travels internationally and is always a source of interesting stories. She was telling me of her latest adventure and I said something about how amazing it sounded and she responded with, “Yeah, sometimes I feel like I’m living vicariously through my own life.” I didn’t even have to write it down. It was imprinted on my brain and now it’s printed on the page, uttered by one of my characters. Newspapers and magazines–The New York Times and The Wall Street Journal are language sources that can’t be beat. If you don’t read the Wall Street Journal, I would highly recommend it. There are wonderful personal stories in there amid the financial news that feature awesome writing. And The New York Times may be the “old gray lady,” but the language, especially in op-eds or columns like “Modern Love,” which talks a lot about emotions, are gold mines of language. I read an interview in Entertainment Weekly a few years ago with a celeb, who was not aging well, and the writer pointed out his “leathery pecs.” I knew immediately which of my characters would have “leathery pecs” and that’s in there as well. Literally decades ago I read a magazine article that used the term “the sappy look of desire.” So descriptive. It was in my word collection all those years and I pulled it out and was thrilled that I was finally able to use it in a story. Movies—The whole premise of my novel grew from a red carpet interview of a young actor, who was wildly popular at the time. He was asked, “So, where do you think it could go from here?” referring to all the screaming girls and obsessive media attention. He chuckled and said something to the effect that someone could jump out from the crowd and stab him and it would all be over. It was like an electric shock, a revelation of just how vulnerable celebrities are and it was the seed from which my story grew. My life—The whole story takes place in New York, where I lived for 13 years. One of the opening scenes takes place in Zabars, a gourmet institution on the Upper West Side of Manhattan. I used to pass by every day on my way to work and often dropped by on my way home. I can still smell the aged cheeses, the freshly baked bread, the sawdust on the floor. Zabar’s is front and center in my second chapter. While I was writing the novel, my sweet dog of 17 ½ years died. It was a gut-wrenching experience, but it provided a deep well of emotion to dip into and pour onto the page. I now have a 16-month old pup, I’ve dubbed “devil dog.” I already know his antics will make its way into a future novel. Densie Webb’s debut novel, You’ll Be Thinking of Me (Soul Mate Publishing, 2015) is the story of a young woman’s serendipitous encounter with a celebrity, a brush with obsessive love, and the bittersweet gift left behind by the very person fixated on destroying her life. Densie’s book was just released in paperback and is also available as an ebook and an audiobook. 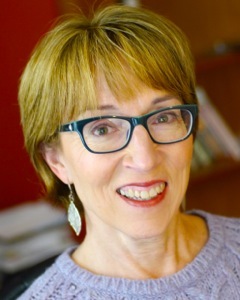 While she still spends her days writing and editing stories about health and nutrition, she writes fiction in the evenings and weekends and is currently working on her second and third novels. 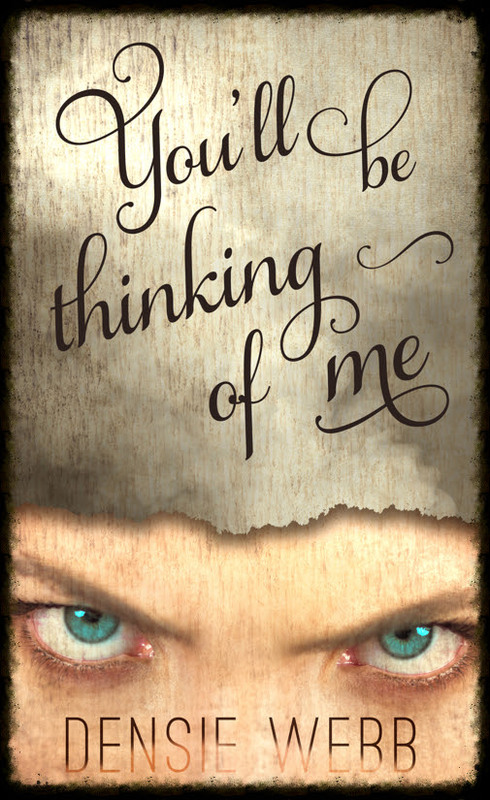 Check out YOU’LL BE THINKING OF ME on Goodreads! There’s a GIVEAWAY! Great post, Densie! Just twittered and shared on WFWA. Thanks so much, Barbara! It was fun to write. Thanks for the awesome post Amy and Densie! So, glad you enjoyed it! Thanks for stopping by. Loved that, Densie! Yes, yes, yes. I loved your Eliot quote; if we do it well, if we create something wonderful, the stolen becomes ours, doesn’t it? Ours because it’s uniquely our voice, different in that no one else could have created that specific metamorphosis for the original. Normandie, aren’t those quotes great? I “stole” them from Austin Kleon’s book. Hi Densie, I’ll be thinking of you when I “steal” during the creative process. Great post. Ha! Good to know. Thanks, Beth! Great case for keeping your eyes and ears open. Wishing you much success, Denise. That is the take-home message. 🙂 Thanks for your best wishes! Funny…I told Amy that even I mistype Densie sometimes as Denise. The fingers just want to go there! LOVE this post, Densie–and so true. I have an author friend who harvests great dialogue from the world around her as well who calls this “conversational shoplifting.” Love the image of constantly scanning. Thanks, Phoebe! And I love “conversational shoplifting.” They’re all modes of artistic theft. And such fun! Great post! I love getting ideas from people I hear on the bus. Eavesdropping is the best! Thanks, Shanna.